No lawn ornament is more famous than the pink plastic flamingo. Garden gnomes are a close second but aren't capable of conjuring the same giddiness as the flamingo, especially when there's a whole flock strategically planted all over the yard. We love that look, in fact, we love it so much that incorporating it into our wardrobe became a new goal we had to accomplish. After an attempt to design a hat from a plastic flamingo lawn ornament, (spoiler alert, it didn't exactly go as planned), we racked our brains for another solution. Perhaps a flamingo purse is possible? 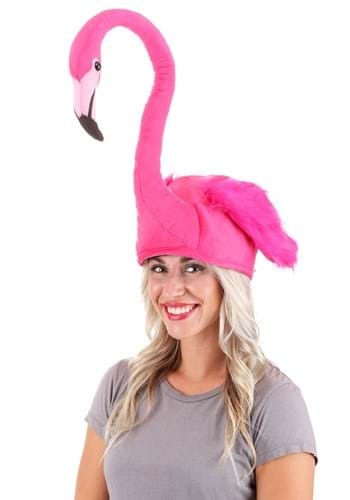 Just then, this flamingo hat flew into our lives, turning our flamingo-fantasies into a reality. It's an accessory that says, "commence vacation mode." Made from lush faux-fur, the soft hat has an adjustable band inside the back edge, making it fit all head sizes. The outstretched neck is bendable so the flamingo can look from side to side. Also, the "secret" cloth pocket allows you to carry around small necessities like an I.D. and cash. Did someone say 'party time?' Head to the luau or backyard barbeque in style wearing the flamingo hat. Also, make sure to take a picture in front of your matching lawn ornaments. It's bound to go viral!